The Dining Philosophers Problem was proposed by Dijkstra in 1965, when dinosaurs ruled the earth. 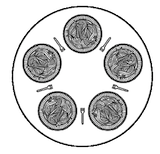 It appears in a number of variations, but the standard features are a table with ﬁve plates, ﬁve forks (or chopsticks) and a big bowl of spaghetti. É com muita satisfação que venho anunciar que a grade de palestras do YAPC::Brasil 2011 já está no ar (minha palestra será sábado)! Esse ano o evento contará ainda com ninguém menos que *brian d foy* como keynote, em sua segunda visita ao Brasil! Brian é o criador da primeira comunidade Perl Mongers do mundo e autor/co-autor de diversos livros de Perl, como “Learning Perl” (o livro da lhama), “Mastering Perl” e “Effective Perl Programming”. Mas… dois dias? Não eram três? Sim, e essa é mais uma novidade: na sexta-feira, dia 4, teremos um mini-curso de UM DIA INTEIRO com o tema “Effective Perl Programming”, ministrado pelo próprio brian d foy! Não fique fora dessa! As vagas são limitadas, então acesse o link e inscreva-se já! UPDATE Aug, 2011: This patch added a new hook to ModelAdmin called save_related(). Now you don’t the hack described bellow anymore. Admin is an awesome Django builtin app to create nice CRUDs for your models, and offers a lot of customizations hooks. You can personalize the templates, perform custom filters, modify newly created objects and if that’s not enough, you can always create your own view to do something it doesn’t by default. The admin docs are great, I’m not going to explain how it works. The intention here is to show a way to modify an object, after it’s saved, and other objects related to it using inlines are saved too. this mean whens you’re adding a Foo, since Related has a foreign key to it, django will display a few forms to add Relateds in the same page. the problem here is that save_model() is called before the inlines are saved. Notice here that the last method it calls is response_add(), and it passes the created object, that’s all we need! If you see the change_view() method (witch it the view called when you’re editing an object) it calls a similar method: response_change(). Their intention is to handle the response of the view, as it docstring says: “Determines the HttpResponse for the add_view stage”. So if you do something there not related to it, it works, wont make much sense if you look at the overall architecture. Maybe django will add a more specific hook to solve this issue later, but I hope it helps you for now. Given the dynamic nature of Python you can do many things in runtime, like add methods dynamically to an object or class. This is particularly useful when writing unit tests. note that we don’t need to create a method with types.MethodType here, because all functions in the body of a class will become methods and receive self, unless you explicit say it’s a classmethod or staticmethod. Here is a nice comparison on dynamically adding methods in Python and Ruby. “Fake objects actually have working implementations, but usually take some shortcut which makes them not suitable for production. A good example of this is the in-memory database. Stubs provide canned answers to calls made during the test, usually not responding at all to anything outside what’s programmed in for the test. This terminology was taken from xUnit Test Patterns book. I’ve already seen cases where people write lot’s of unit tests, abusing from mock objects, but without good integration and acceptance tests you can’t really guarantee that each scenario is really working as expected. Django brings a built-in user authentication system, it includes an User model which has the most common attributes. But in most applications you may need to store additional attributes to users. Django has a way to do this too. From now on your User objects will have a get_profile() method. See the related_name='profile' parameter, now you don’t need the get_profile() method anymore, just use user_instance.profile. Django doesn’t handle the first topic, there is a great app to handle registration. The second and third topics can be done with django.contrib.auth app, this is exactly it’s purpose. And then you have the forth topic, which is profiles. As you can see, it can be done as a separate app. A user has a profile. So makes sense to have a profile attribute in the User object. If you split features in apps like this it’s easier to reuse too, that’s the idea of django apps after all! The django-registration is an example. And as you can imagine, there are apps to manage profiles too. As you can see, it quite easy to manage user profiles in django. Although there is a way to hook you profile model in settings.py, you can do it with a simple foreign key. And as usual, there are a few reusable apps around to handle the generic stuff. Segue os slides da minha palestra Desenvolvimento web com Python e Django. Apresentei essa palestra no Jatic, na faculdade Facisa em Campina Grande, PB. E também no CITOS, na faculdade Univem, em Marília, SP. Veja outras aprensentações minhas no Slideshare. Note o parâmetro localize no campo DecimalField do formulário. Agora sim, basta acessar debito.valor_formatado. Confira a documentação para mais detalhes.